The mention of Six Flags Magic Mountain may instantly conjure mental images of some of the best roller coasters in the world… and rightfully so. 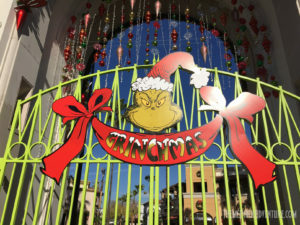 However, in recent years, Magic Mountain has really stepped up its game – as has many of the other Six Flags properties – and has focused a great deal of attention on special seasonal events such as Holiday in the Park. 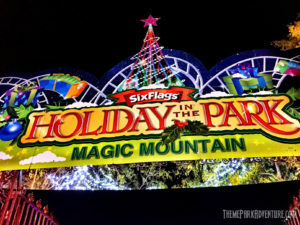 Holiday in the Park transforms much of Magic Mountain into a festive winter wonderland of twinkling Christmas lights, whimsical walk-around characters, sweet treats, Santa Claus, and of course, amazing thrill rides. While many of our readers have Magic Mountain on their radar because of Fright Fest, it certainly should be noted that we really love what they do each year now with Holiday in the Park – and we think you will, too. 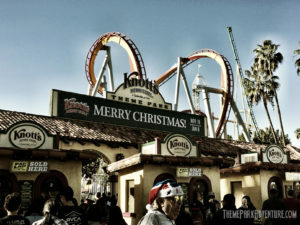 Knott’s Berry Farm certainly knows how to do holidays. Immediately following its world-famous Scary Farm event each year, the park transforms into a winter wonderland, becoming Knott’s Merry Farm. 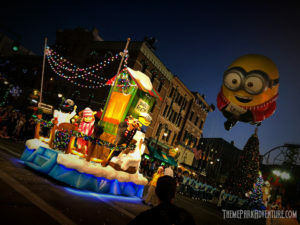 While you’d think the team behind the scenes at Knott’s would be exhausted this time of year (and you’d be right making that assumption), they go up and beyond to deliver an event that is nothing shy of world-class. Merry Farm 2016 is the best we have ever seen the park look during the Christmas season, and we’ve grown up with Knott’s. Each year, Cedar Fair management works with Knott’s, raising the bar and really pushing everyone involved to dig deep and go big. The company doesn’t throw millions at the Christmas season the way Disney or Universal do – but they go head-to-head with those very companies by way of live entertainment and quaint, classy decorations that truly resonate with guests and create a gorgeous setting to celebrate the holidays in with friends and loved ones of all ages.